For her irrepressible good humour I loved my sister Susan very much. I am the oldest of the four boys, she the oldest of the four girls. Additionally, we more or less shared a birthday albeit a day apart. 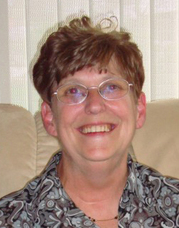 Susan K. Rice, 65, passed away on May 6th 2015 at the Community Hospice House in Merrimack, NH. She was born on April 4, 1950 in Somerville, MA, the daughter of the late Roy G. and Elva (Newton) Oxton. Why do we say "...sorry to hear about..."? In my humble opinion, word maven that I claim to be, in that phrase, "hear" implies that one would rather not have heard. If we cannot say "...sorry about the death of..." then at least perhaps "sorry about" or "sorry for". But "sorry to hear"? Anyone explain that? My Isuzu pickup, a.k.a. TinyTruck, has for a while been exhibiting a misbehaviour. A couple of them. Stuttering and bucking at low engine RPM was one. Excessive wear on the inner edge of the left front tyre was the other. Alignment check showed the camber was a whole degree off. The LF wheel was tilted in at the top. How did it get that way is unknown. Correcting the excess is a matter of adding or removing shims from between where the wheel/ball joint/frame is bolted to the chassis. At the alignment shop the technician struggled to loosen two nuts. The steering column was in the way of his wrench. Eventually he gave up trying to break free the nuts and suggested I take the truck back to my mechanic to have the nuts loosened. Typical case of the loose nut behind the wheel, eh? Allan said the nuts were not supposed to be loosened, they were welded to the frame. You're supposed to go at it from the other end and loosen the bolts. And he showed me how that is accomplished. Back to the alignment shop. At first the alignment technician was adamant that he knew what he was doing. The bolts are supposed to be with splined heads captured in the frame such as wheel studs are, and you loosen the nuts. But to do that one would have to move the steering column out of the way. What I told him to do was easier but contrary to what he knew and not in keeping with the procedure necessary for the alignment equipment. Fortunately he acquiesced before he got in too deep. To get at the bolts one must first remove the wheel. Then a cover plate. Behind that cover are the two bolt heads. After the shims we found were removed he reinstalled the wheel to test the alignment. Perfect! Then he had to again remove the wheel to tighten the bolts and replace the cover. Then replace the wheel and check the camber one more time. All good. Well, I learned lesson today, he said by way of apology as he finished up: Sometimes the customer really is right after all. Still not sure about the stuttering problem. But in the course of installing a new aftermarket cruise control I found a screw missing from a micro-switch on top of the gas pedal bell crank. No idea what that switch does but it couldn't do its job with one screw missing. Found a screw in my hell-box and now the stuttering seems greatly reduced. The Social Shitter - Whatever Happened to the Three-Holer? This morning the thought occurred to me... Something about privacy; how do astronauts do it; why are there now partitions separating sections of gang urinals where there didn't used to be... You know, we as a people mostly look forward to breaking bread together but not to breaking wind together, at least not beyond about the third grade. In a certain Men's Room I frequent there is a urinal and a commode, separated by a partition. I walked in last Towel Day and a face glared at me over top of the partition, “Busy!” he said. There's room for two, said I, as I proceeded past him to the commode. What is this morbid fascination with privacy that permeates our society these days? Did three-holers go the way of gang showers? 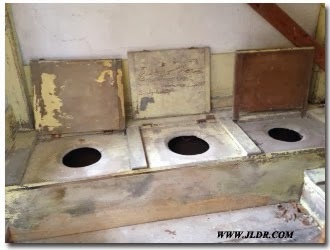 Not Knowing About Defecation (pdf) and The Social Life of Faeces (pdf), both by Sjaak van der Geest, should help you get to the bottom of it. Finally! After far too much stupidity and procrastination The Cat Drag'd [out] of Tonopah and headed north. Presently at North Ranch in Congress, 1500 feet higher and 5ive degrees cooler than Tonopah, picking up the pieces. No matter how many things I remember to pack and tie down there are always some things which manage to find their way to the deck. Today's main concern is some strange ticking or clicking. Seems to be in step with wheel rotation speed. I hope the sound is just some stone stuck in the tyre tread. Congress tonight, up the Yarnell Hill, through Skull Valley, to Prescott tomorrow. Got to get up that hill at very early o'clock cos the temperature will be coming up close on my heels. In Prescott AridZona this morning. Long slog up the Yarnell Hill. Motor running really hot. Coaster brake not working correctly. More things to fix. The clicking sound I do not hear this morning. That's a good sign. Hurricane Hazel is getting used to travelling again. Takes her a day or so to find her "sea legs". Today I am in the woods a bit north of i40x151 between Ash Fork and Williams AridZona. Dawn started at 60f and already the temperature is up to 75f, headed for 90f or so. Bright sun on the solar panels is making about 13a to run the radio and computer. The cat of the moment, Hurricane Hazel-Rah, is outside getting acquainted with the cacti and the juniper. A.K.A. The Cat in The Front, she is the third of that line. Such a nice cool start to the day I decided to cook breky. YUM! Today I'm going to sit here and watch the juniper grow. Also there is a water leak in the radiator water-spray-cooler to investigate. And one of my neighbours a few trees to the east is someone I know so there is some visiting to do. Noon o'clock now and the PV array is making 35a. Temperature up to 97, 98, 95, and 98 here. All thermometers are in the shade for the moment. With a nice breeze. Must be 111f at Tonopah. "Although the actual atmospheric lapse rate varies, under normal atmospheric conditions the average atmospheric lapse rate results in a temperature decrease of 6.4C°/km (3.5F° or 1.95C°/1,000 ft) of altitude..."
Several people who were potential visits and layovers responded to my first epistle that they were busy or out of town. One in France, another in Kansas, another in court... Just as well if I am going to have any chance at all to catch up. The Yarnell Hill, coming up from Congress to Yarnell (of course) at 06h00 was not too nasty a climb. Motor got really hot but the sprayer kept the radiator cool enough. Then the scenic route through Skull Valley to Prescott was a breeze. Lunch with Jerry (Thank you very much Ka1bab) was a good visit. Then on to see Kevin in the Granite Gardens for a quickie visit before chasing after Tom who was somewhere north of Paulden, north near Drake. Well, by the time I got to Drake Tom had checked in from this place called Welsh Road. So that meant another hill to climb. Just as well, another climb also means another few degrees lower temperature. Met some new friends on the corner of Welsh Road and Old Rte 66. They live off grid in a work in progress 55' semi trailer with a ragdoll Siamese cat named Itchykaibo Cat and a wood stove on a brick floor. Very cool! Her name is Jewel. His is Warren. The last full weekend in June is an annual Ham Radio event where Amateur Radio people practice setting up their stations in a field somewhere. Pot Lucks, contest operations, 24 hours of continuous transmitting and receiving, keeping score... All in the name of training and fun. Well, NU7DE, the club station of Desert Circle ARC, out of Magic Circle, La Posa South, Quartzsite, did Field Day at the corner of Welsh Road and Old Historic Route 66, i40x151, between Williams and Ash Fork, AridZona. The club had two operators part of the time which proved to be an interesting test of capability as well as a training exercise at The Cat Drag'd Inn. In the 24 hour period [we worked only half that time] we made over 90 contacts—some by SSB voice on several bands and some by RTTY (radio teletype)—which was a better score than last year. Getting ready to leave Welsh Road and TinyTruck would not start. Dead battery. Worked Ok a few days earlier but not this time. Got hitched up anyhow and on up the hill to FlagStaff, down the other side, on to Winslow. TinyTruck still wouldn't start, left me standin' on the corner. New battery time. Plus with Groceries and Diesel for the bus, a 500$ day. Onwards. From Winslow to Saint Johns to find yet another friend not at home. Just as well. Found my way to the south gate of The Painted Desert where there is a Petrified Wood Museum and Gift Shop with a sign proclaiming Free Camping. It was that time of day; I think I will stop for the night. It never ceases to amaze me how filthy and stupid some people are. 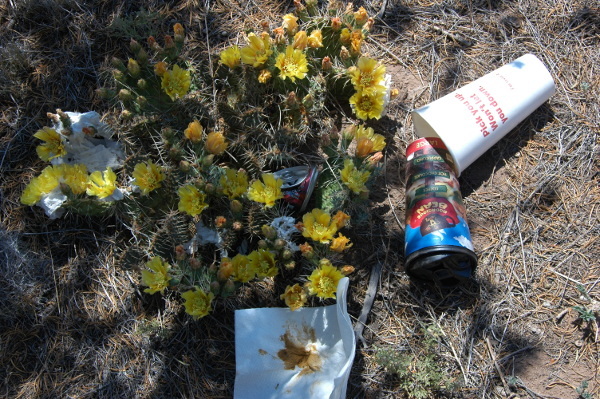 This morning at the Red Hill Rest Area I had to face that all over again. 15vii6 ...Masquerading as a normal person day after day is exhausting. Still. In Pie Town again. Part way through Monsoon now. 2.3 inches of rain so far in July. This is the Year of The HotTub. Hurricane Hazel is doing well except that the ground is too muddy for her to dig cat-holes so I am still cleaning her litterbox. At least she is not constrained by society to masquerade as a normal cat. The labyrinth is overgrown--needs weeding. Started this migration a month late cos of medical, dental, vehicle issues, but fortunately most of the folks I would visit were away so I was able to arrive here almost at the same time as last year. Met some interesting new friends along the way--see the note about Jewel & Warren supra. Yesterday the overnight low was 50f and one wag observed: One more degree down and we'll be in “The Forties”. This morning, as I write, the outside temperature is 46f. The heat is indeed On. Such extremes! A week back, when The Cat Drag'd Inn to Pie Town, the mid-day temperatures were in the nineties. Already there is a noticeable darkness later into the morning. The sun is southering, the days are shortening, Summer is waning, and the hurrier I go the behinder I get. So far there has been measurable rain every day since I arrived. Three inches so far. 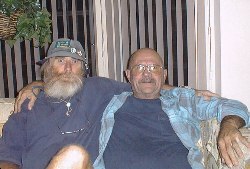 My cousin, David N. Kirwan, 75, of Venice, FL, the oldest son of my mother's kid-sister, Aunt Kay, passed away July 9, 2015. I made a list of people within my First Degree of Separation who have died over the years since I became aware. Cottonwood campers here last night. Fun group of kids, helped out with a lot of yard work stacking fire wood, moving rocks, and asking riddles. (What has lakes but no water, forests but no trees, roads but no cars?) They left early this morning. I spent some time tracking down a leak in the hot tub and needed a well earned nap. After nap we went up town to find some lunch at a fundraiser. Met Eric who has been on the road, on a bicycle for a couple years. Bucket List of places to visit, odd jobs here and there, travelling by bike. Three other Continental Divide Trail cyclists showed up at the Toaster House Hostel. Eric showed us a headset cap from http://kustomcaps.com/ which was provided by http://salsacycles.com/bikes/ to promote the CDT race. The cap could be traded for two slices of pie at Pie-O-Neer or Pie Town Cafe. Nita had heard about them a few days earlier and really wanted one. Later she found one, a red one, on the ground at the Toaster House, no doubt dropped by some racer. But then she lost it, the cap never made it home. Today whilst we are putting up supplies at the Toaster I found a red cap right where we had parked, almost under the rear wheel. Well it could have been the one she lost so I gave it up. Later, unloading more stuff from the trunk of her car I found another red cap under a case of cheap beer. So now we each have one. Warren and Jewel, whom I met at Welsh Road, managed to get their tractor trailer into the town park, under a tree, back out of the way. No telling how long they will stay. Fun visit with them and their Ragdoll Siamese this afternoon—lots of storeys until the rain started. Last year at Faywood I saw Ken wearing this most beautiful robe. Wearable art. Took several months for Gwen to negotiate material and measurements and then more months of sewing in Socorro before it was ready to deliver. One side-storey was that of getting the trim shipped in from Korea. Some times it takes for ever for the Postal Service to lose a package and once they give up and the seller makes a refund; then of course the package is delivered. Tracking, even at this writing, still says the parcel is en-route. The robe required some alterations; I think I've shrunk since Gwen first measured my size and shape, and I still need to find the best belt or sash to go with it. Tag End of July—Jeff came to visit. Monday I went shopping. Did I tell you about losing Bill's cheque for an hundred and some dollars? Well, I did. Or at least it disappeared that Monday morning he gave it me. Lost an' gone forever oh my darling... So we dickered about stopping payment. Since I'd since gone shopping in the big city, who knows into whose hands the unpayee'd and unendorsed Leaping Brook-Trout cheque had fallen. At least the amount was filled in so he was safe from going bank-rupted. On Tuesday Jeff, my world-travelling friend just in from Burma, stopped by for supper on his way from hither to yon. (Yawn?) We had a great visit. He brought me a cool new hat and a few other toys, we enjoyed a break in the Monsoon Weather, and worked together to perform emergency micro-surgery on the hot tub. On Thursday he got away just in the nick of time. Shortly after he left Thursday morning I hit the rack for a well earned nap. Then I went out to do the laundry and managed to return in time for lunch. The sky broke as I was hanging the last towel on the drying line. Disguised as a nice gentle rain this thunder storm came out from behind the chicken coop, where no doubt it had been impatiently blowing in the wind an d saving up the rain drops for two days, and proceeded to shatter my dream of a pastoral clothes drying afternoon. Half an hour later there is 0.54" in the rain gauge and my laundry is wetter then when I pulled it from the washer. At least I had the foresight to run the bedding through the dryer at the internet laundrateria. Then, in the course of cleaning up after, I found the lost cheque. Under the galley table, under Hurricane Hazel-Rah's kibble dish, teeth marks punctuating the blank Pay To... Says she: Who, me? The brook trout made me do it. Now suddenly we are at the Ides of August. TinyTruck sounds like a mellow Harley. There's a hole in the muffler Dear Eliza and no amount of straw is going to fix it. The motor has been bucking and snorting for a few weeks. Getting worse as the miles go by. Then this loud backfire! Wham! So the problem is getting serious. New muffler appears to be not available from NAPA; I will have to shop around. May have to go as far as Show Low. Still looking. At dusk last night there was a growling and thudding under the bus. Hazel was in, against the back window, hackles raised. Out the door I went in time to see Muenster give chase to a black streak headed north around the back of the shako and then east towards the shop. I followed and poked around inside and out the shako and the shop and under the shed behind. Nothing found. So the stray, not seen for a few weeks, is back. Last night I turned the last page in my Journal #31. Today I open #32, tabla rasa. Someday, when all is said and done these books will either become fuel for someone's fireplace or fodder for a reluctant biographer. In the mean time... This week the swelling of water on my knee seems to have reduced. They are both nearly the same size again. Not sure what was the cause. My doctor said not to worry unless the condition affects normal activities. What's normal about this masquerade? Copyright © 2015, A.J.Oxton, The Cat Drag'd Inn , Tonopah AridZona 85354-0313.